Providing you the best range of flexometer, vamp flex tester, shoe vamp flex tester, circular blade cut resistance tester, shoe flex tester and vamp flex testing machine with effective & timely delivery. The ability of light leathers and leather-cloth used in manufacture of shoe uppers, gloves, and garments to withstand repeated flexing without cracking is determined with the help of a flexing endurance test. In Flexometer test, test specimens in shape of rectangular pieces are folded and clamped at each end to maintain them in a folded position in a set of grips, one of which is fixed while the other is able to oscillate. The movement of the oscillating grip causes the fold in the test specimen to run along its center. This operation is carried out repeatedly and the test specimens inspected periodically to assess the damage produced. The equipment used for this test is called as Flexometer. 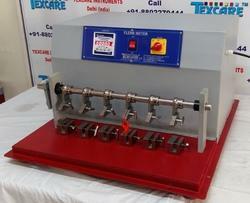 This machine used for Leather and Footwear Testing. The Vamp Flex Tester is used for assessing the tendency of shoe uppers and lining materials to crack or fail at the flexing creases formed in the upper during walking. In this test, square shaped test specimens are held at their opposite edges in two inverted V-shaped clamps having their holding faces in the same plane. One of the clamps is kept fixed while the other is made to move towards it and back repeatedly, producing cracks similar to those formed in the vamp of the shoe. This process is repeated continuously and the condition of the test specimens checked after different specified number of flexing cycles till failure occurs. For conducting resistance to hydrolysis the test specimens are conditioned in saturated water vapour atmosphere by keeping them in a dessicator above water for seven days at 70°C, followed by conditioning under a standard temperature for 24 hours before conducting the flexing test at -5°C. We are a popular company known for providing Shoe Vamp Flex Tester to the clients. 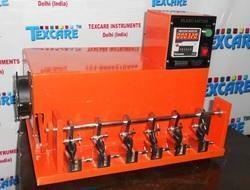 This machine has been designed to test materials to BS EN 388:2003, Section 6.2 Blade Cut Resistance. A test sample of given size is clamped in the easily removed holder. The holder isthen placed onto the machine. The arm is gently lowered so that the blade touches the test sample. With the counter set to zero the ‘Start Test’ button is pressed to initialize the test. When the rotating blade penetrates the test sample the machine will automatically stop. The number of cycles is displayed on the counter screen. BS EN 388:2003, Section 6.2 Blade Cut Resistance. 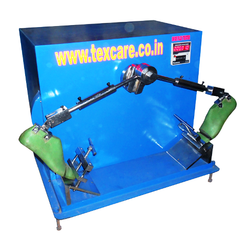 The Shoe Flex Tester is used for determination of the ability of the full shoe to withstand the effect of flexing stresses produced on the different parts of the shoe. Although the various parts like uppers and soles of a shoe are tested separately for flexing endurance with the help of flexometer and Ross flex tester, the shoe flex tester gives results which are more related to the actual performance of the shoe as a whole. 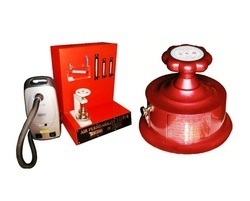 Pioneers in the industry, we offer Footwear Testing Instruments such as Flexo Meter, VAMP Flex Tester, Shoe Vamp Flex Tester, Circular Blade Cut Resistance Tester, Shoe Flex Tester from India. 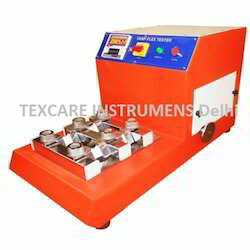 Veslic Rub Fastness Tester, designed to carry out a rub fastness test on the surface of leather to determine the amount of ‘marring’ of the leather surface or the finish and to assess the amount of color transfer from the sample to the rubbing pad under dry or wet conditions.